THUG Pro is a mod for the game Tony Hawk's Underground 2. The mod completely overhauls the original game with many features and assets, community-requested additions & tweaks. The mod is currently in beta status. -Dozens of levels from across the Tony Hawk's franchise. -Different user-interface themes to select, including ones based on skateboard sponsors, and original themes from THPS4/THUG/THAW. -Custom game launcher in which gamepads and keyboards can be assigned. There are no longer "stand alone installers" or versions of THUG PRO packaged together with THUG 2. You must have Tony Hawk's Underground 2 installed to play this mod! -It will download the latest beta and update your game. -It will ask to import saves from your original THUG 2 game, and optionally create desktop shortcuts. We recommend letting it do both. -New releases will automatically download and update when you launch the game. How can I use Xbox 360 or Xbox One Controllers? 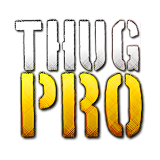 They can be set up normally in the THUG Pro Launcher. Please use the other boards of the Thmods.com THUG Pro forum to give us feedback, report bugs, or let us help you in resolving any issues you are having. We are more than happy to help!